Dogs need different types and amounts of food during their life stages. Younger animals require more energy, protein, and minerals than older dogs. Active field trial dogs, and dogs who are outside in cooler weather would also have greater energy needs. Pregnant or nursing dogs require increased protein, minerals, and energy. 'Couch potato' dogs, however, have much lower energy needs. Older dogs, even if they remain active, may require fewer calories than when they were younger. Some dogs regulate their intake well, others eat anything in sight. In general, it is best to provide food as 'meals' rather than having a food bowl filled with food available at all times (free choice, ad. lib.). This way it is easier to monitor intake and food will not become stale. In a multiple pet household, providing food as meals also helps to ensure the pet is eating the food appropriate for him. It is easy for us to put on a couple of pounds and not notice it until we try wearing something we have not worn for a while. It is even harder to notice small weight gains in dogs. By routinely weighing your dog (at the same time of day, on the same scale), you will be able to notice a slight weight increase (or decrease) before it becomes a serious problem. 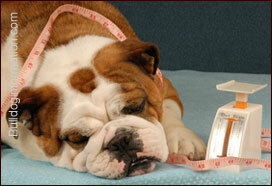 Dogs who are overweight while growing have a greater risk of becoming overweight as adults. We need to make sure growing animals have adequate nutrition, but we do not want to feed too much. In addition to contributing to weight problems as the animal ages, excess weight when young can contribute to other problems such as joint disease. The extra calories and decreased nutritional value of treats and table scraps are often the biggest offenders when it comes to weight control. Treats are generally better than table scraps, and have their use, as when training dogs to 'come.' But giving too many treats can have serious consequences. Most dogs, when it comes right down to it, would rather have your attention than a treat. Spending extra time playing or grooming your dog will probably give you both much more satisfaction than the treat, which is gobbled up in three seconds and then forgotten. Although most weight gain in dogs is simply due to feeding too much or exercising too little, there are medical conditions which can contribute to obesity. Many of these conditions can be treated. If your dog has an unexplained increase in appetite or weight, have your dog examined by your veterinarian to be sure there is not a disease process causing the problem. The Bulldog Information Library 2003-2010 © All rights reserved. Original idea, design and development by C. Marien-de Luca. Bulldog photo by Willee Cole.